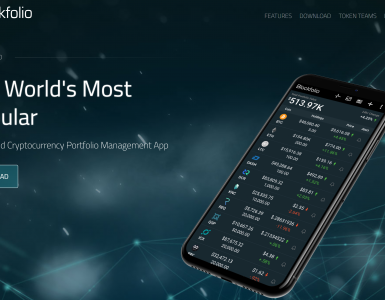 Cryptocurrency portfolio trackers are particularly useful if you have accounts on more than one cryptocurrency exchange. They give you a way to keep track of all your assets without having to login multiple times. Shrimpy, however, goes beyond just tracking your assets. 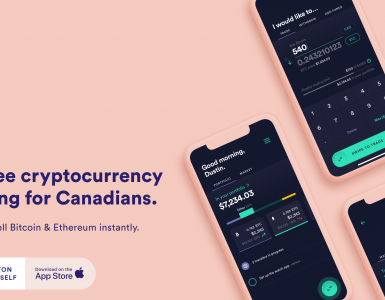 When prices change, Shrimpy can use crypto exchange APIs to automatically rebalance your portfolio for you. 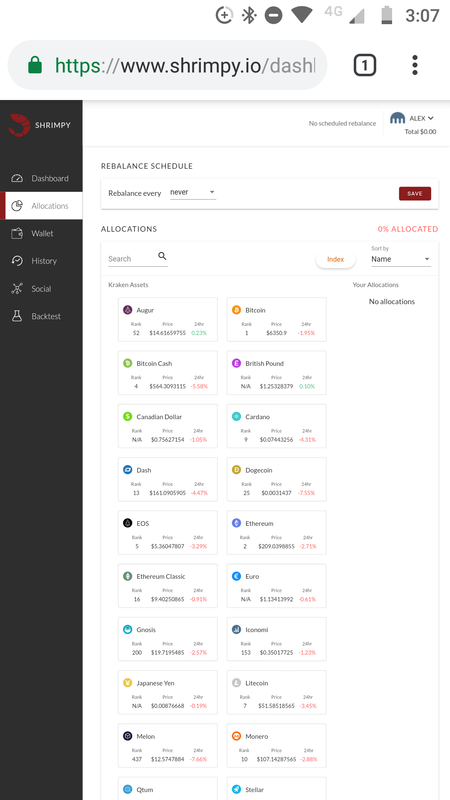 This lets you make sure that your portfolio is always split up the same way. Another key feature is social trading. Premium Shrimpy users can chat with other crypto traders and view their portfolios. Read on to learn everything you need to know about Shrimpy before you try it out. Automatic rebalancing. Shrimpy’s ability to place trades on your behalf gives you the option to automatically adjust your portfolio when crypto prices change. Basic features are free. You can use Shrimpy as a basic crypto price tracker for free. The rebalancing feature is also free. Social trading. The premium version of Shrimpy lets you chat with successful crypto traders and view their portfolios. Backtesting. 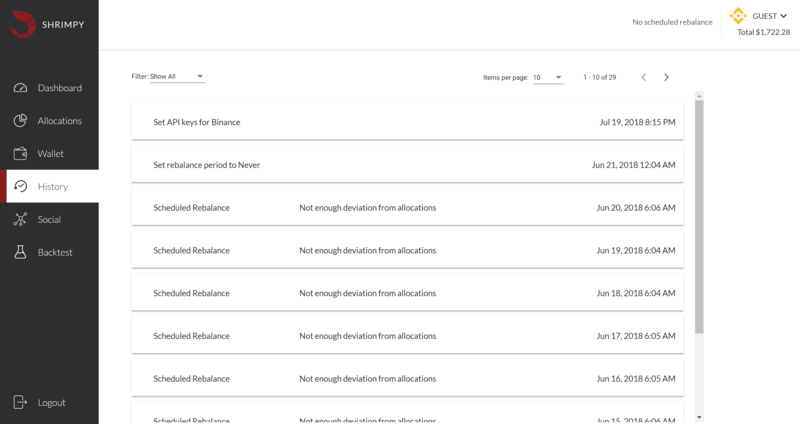 Backtesting– another premium feature– analyzes your portfolio and tells you how your portfolio would have performed if you would have used Shrimpy’s rebalancing feature. Reasonable subscription prices. A premium Shrimpy subscription only costs $8.99 per month. Dedicated development team. Shrimpy’s development team answers questions and responds to feature requests on Reddit and other social media sites. Limited crypto exchange support. Though Shrimpy’s developers are adding support for more exchanges, Shrimpy currently only supports six crypto exchange APIs: Bittrex, Binance, Kucoin, Coinbase Pro, Poloniex and Kraken. Social features only work with Bittrex and Binance. Support for additional exchanges is in development. Essentially, Shrimpy is a cryptocurrency tracker with automatic rebalancing capabilities and social features. The core features are free, but paid users can access an analytical tool and social features. No long after that introductory post on BitcoinTalk, Crabby decided to pivot and rebrand itself as a cryptocurrency tracker called Shrimpy. The move allowed the project to stake out a more unique niche for itself. There are many cryptocurrency trading bots, but there aren’t many cryptocurrency trackers that can place trades automatically. Shrimpy’s core leaders are experienced software engineers who attended school together at the University of Illinois at Urbana-Champaign. Michael McCarty – Co-founder, CEO. Before founding Shrimpy, McCarty was a software engineer at Samsung and Boeing. He started his career at NASA, where he was an Associate Research Scientist. Matthew Wesly – Co-founder, CTO. Wesly also has a background in software engineering. He worked at KMC Systems and MedAcuity Software. Shrimpy’s main value proposition is that it’s one of the only cryptocurrency trackers that has a built-in auto trade algorithm. Few other trackers are capable of automatically placing trades. In addition, Shrimpy’s social trading functionality is quite innovative. Here’s a closer look at Shrimpy’s core features. The auto-rebalancing feature uses Shrimpy’s trading algorithm to place trades on your behalf. Before you can use auto-rebalancing, you have to log into whatever exchange you want to connect to and create an API key. Shrimpy’s built-in social features let you follow successful traders, interact with them and learn about their strategies. Currently, you can only use these features if you trade on Bittrex and Binance. However, Shrimpy says that it will add social trading support for more exchanges soon. Shrimpy’s backtesting feature gives you the ability to compare a standard “hold” strategy to a trading strategy that utilizes Shrimpy’s rebalancing feature. The Shrimpy interface populates the backtesting graph with example data, which shows how the feature works. If you want to backtest your own portfolio, you have to upgrade. Shrimpy’s main limitations are due to the fact that it’s only a year old. The developers have made significant progress, but they are still adding support for more crypto exchanges and enhancing Shrimpy’s social features. Shrimpy has numerous customer support options, including live chat, a detailed FAQ and a detailed knowledge base. In addition, the support team regularly interacts with the Shrimpy community on Reddit, LinkedIn, Facebook and Twitter. 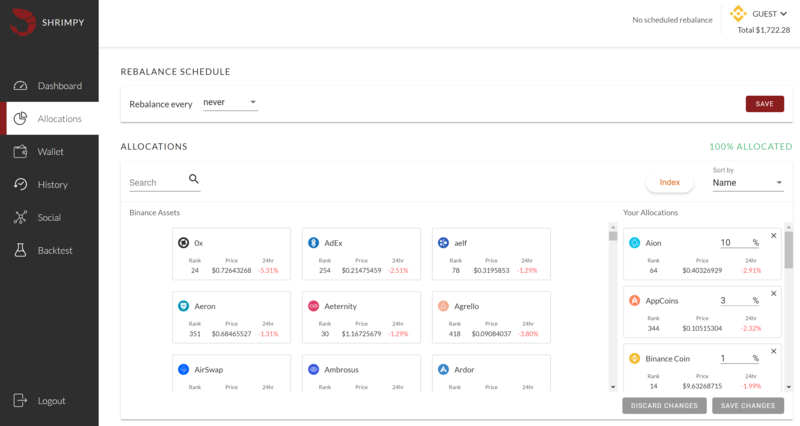 All of Shrimpy’s core features– exchange linking, asset tracking, portfolio rebalancing and the ability to block Shrimpy from managing certain blacklisted assets– are free. For $8.99 per month, you get enhanced social features and access to an analytical tool that lets you go back in time and see how rebalancing may have helped improve your portfolio gains. Shrimpy’s interface consists of seven tabs: Dashboard, Allocations, Wallet, History, Social Backtest and Settings. The Dashboard tab is the first view you see when you log in. It lets you see how your assets are performing. If you’ve connected multiple exchanges, you can switch between them via the menu on the top right part of the interface. The Allocations tab is where you can set up Shrimpy’s auto-rebalance feature. After you type in your desired percentages on the right side of the interface, Shrimpy will initiate trades on your behalf to ensure that the percentages remain the same. You can set Shrimpy to automatically rebalance after a certain number of hours, days or weeks. If you store any of your crypto assets offline in a cold wallet, you can add the balances so that they’ll show up in your portfolio on Shrimpy’s Wallet tab. The“Blacklist” option lets you set up advanced trading strategies by blocking Shrimpy from managing specified crypto assets. This blog post from the Shrimpy team explains how Shrimpy’s Blacklist feature works in greater detail. The History tab displays a detailed, time-stamped list of all the actions that Shrimpy has performed. Shrimpy’s Social tab lets you view and interact with other cryptocurrency traders. By default, Shrimpy users with strong portfolios appear toward the top of the search results page. Free users have limited access to the app’s social features. The other premium feature is accessible through the Backtest tab, which contains a tool that lets you find out if rebalancing can benefit your portfolio. The backtest chart compares a standard hold strategy to rebalancing with Shrimpy. The interface populates an example portfolio, which allows you to see how the feature works. If you want to use the backtesting feature on your own portfolio, you have to buy the premium upgrade. The most interesting thing about Shrimpy is its ability to automatically rebalance portfolios. Rebalancing is a tried and true method for optimizing gains that traditional traders have been using for years. Because Shrimpy’s rebalancing feature is free to use, it’s definitely worth trying out if you use any of the exchanges that Shrimpy currently supports. 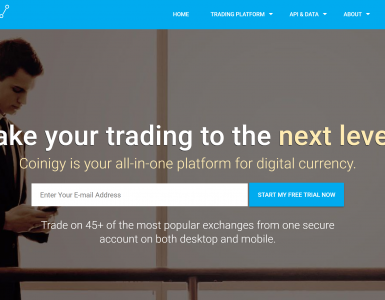 Shrimpy’s other innovative feature– social trading– brings to mind eToro. eToro is a derivatives market that has a built-in social network feature resembling Shrimpy’s. MIT Media Lab researcher Alex Pentland mentioned eToro social trading in his book Social Physics: How Good Ideas Spread. According to Pentland’s research, collaborative trading can result in 30% better returns. Despite those benefits, few cryptocurrency exchanges have social features. But if Shrimpy’s social network becomes popular, it could motivate exchanges to either support Shrimpy or create their own built-in social networks. The future success of Shrimpy will likely depend on how well it can communicate the benefits that it offers to newbies. Last year, large numbers of beginner investors bought cryptocurrency after the price of bitcoin reached record levels. Many of those investors probably still hold cryptocurrency assets and can benefit from Shrimpy’s free rebalancing feature.